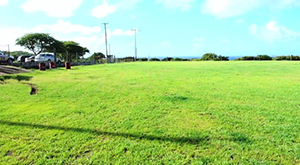 NIA CHARLESTOWN NEVIS (November 18, 2014) –The Nevis Island Administration (NIA) begun the process of outfitting the Brown Hill play field with new facilities, a project undertaken by the Ministry of Social Development. 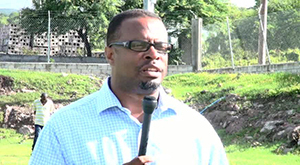 During a field visit to the play field on November 18, 2014, Permanent Secretary in the Ministry of Social Development Keith Glasgow explained what should be expected at the end of the project. “We have present here workers of the maintenance crew of the Ministry of Social Development. We are trying to equip the Brown Hill playing field with facilities. We are going to have a bleacher stand. We are going to have bathroom facilities and we are going to have a presentation stand as well. The first building that we will be working on will be the bathroom facilities,” he said. Meantime, Deputy Premier of Nevis and Area Representative for the St. John’s Parish Hon. Brantley, spoke of the projects the Administration had embarked on in the parish. “I think people who know me, know that I grew up in Brown Hill and this playing field, a beautiful playing field, was created many years ago but with no infrastructure. There were no bathroom facilities, no bleachers. There’s nothing for the comfort of the students who use it, the ‘Brown Hillians’ who use it and the patrons who come to participate in various sporting events, whether spectators or otherwise and so, this is a promise that we made, a commitment,” he said. Mr. Brantley regarded the commencement of work during his visit as a simple but significant process. “So here we are making an additional investment in the comfort and wellbeing of the people of St. Johns and the good people of Brown Hill and so, me as a ‘Brown Hillian,’ I am very happy to be here. I hope and trust that the structures built here will be used to the benefit of the people here, that they will take care of them. I expect them to and that the people of Brown Hill can be proud,” he said. Mr. Brantley also thanked those who had assisted in making the project a reality. 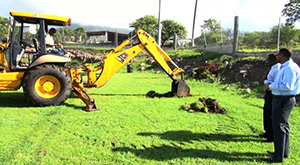 “I want to thank the Junior Minister Madame Hazel Brandy-Williams, who clearly, as we all know deals with the day-to-day functions of the Ministry of Social Development and the Ministry of Sports and also of course the good Permanent Secretary, who has been very active in getting these things done for the people of Nevis. “So we are working as a team to deliver what we have committed to and here in Brown Hill. The people of Brown Hill can feel justly proud, that in another two to three months, we will have what it takes right here at this field, to enhance the comfort of what they do. The field is already lit. The field is already here. We feel it can be a first-class field for first-class cricket, first-class football, first-class sporting and related activities,” he said. The Minister also expressed the view that he believed the play field could become a hub of activity, on completion of the project, with the proper facilities in place that would allow the community to enjoy them in comfort.